So the other week when I introduced you to Debra from SmithBites, I didn’t know at the time that she was going to become the very first Food Memory contributor with multiple entries in the project. Here’s how it happened. I badgered her until she agreed to let me use The Professor’s Black Beans and Rice in the hopes that I would move on to harassing someone else. And I did. And then I made an abrupt U turn and headed back to her inbox. Because when I read her post about Butternut Pear Curry Bisque, it was as though the Universe had taken all the good things about Food Memories and tied them up with a pretty bow. Greedy like I am, I had to have it. Ever gracious, Debra said yes. I would like to thank her for not changing her email address or running away screaming every time she sees my name in her inbox. I’d also like to thank her for capturing the very essence of why I believe Food Memories are important and sharing a big bowl of it with us. They say a picture is worth a thousand words but I’m here to tell you that a recipe or a meal is also worth a thousand words. For some, that dish might be a special birthday cake, cinnamon rolls or bread; to others it might be a meatloaf, pot roast or onions and garlic sauteing in a skillet. A particular scene in Ratatouille captures this point so well – the hardened, stoic, food critic Anton Ego, takes a bite of Remy’s simple Ratatouille and the audience is immediately transported back to Ego’s childhood home where the boy Anton is served ratatouille while being comforted by his mother. 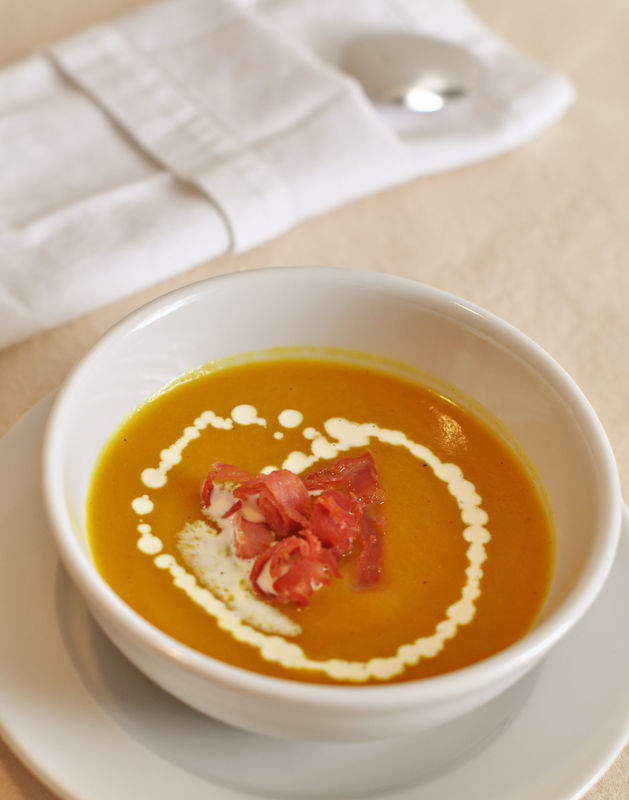 And for me, this bisque is one of those dishes. I know it’s officially fall when The Professor breaks out the dutch oven, grabs a butternut squash from our garden and picks an armful of pears from our tree. The first time he made this bisque, I was in Washington staying with my parents – my dad had been diagnosed with cancer a couple of months prior and I was helping them pack for a move. I remember The Professor calling very early in the morning to tell me he had found a delicious recipe for a bisque that had pears and butternut squash in it . . . I also remember thinking that the recipe didn’t sound very appealing. Notice I said I thought – I didn’t say I voiced my opinion – which is shocking I know, but he was cooking for me again, so don’t rock the boat, right? (Plus, he was making his case for vegetarianism.) But I also remember coming home to this fabulous fall bisque – and The Professor has made it every single year since 2000. In writing this post, we discovered something new about our relationship – he’s all about the tried and true familiar recipes while I’m all about flipping through my mountain of food magazines and/or cookbooks discovering unique and exciting ones. He’s always the one to make Black Beans and Rice, grilled cheese sammies with tomato soup, scrambled eggs, grilled pizza, the Thanksgiving smoked turkey breast and this butternut pear curry bisque; he follows the recipe to. a. tee; always measuring exact amounts, never eyeballing an ingredient – meticulous and precise. I, on the other hand, am racing through the directions, capturing the essence of a recipe and then I’m off doing my own ‘loose’ interpretation; and I have only a handful of recipes I’ve made more than once. We’re all connected through food in one way or another; and while it would appear that The Professor and I would clash in the kitchen, we actually compliment one another. There are times when I’m in charge and he’s the sous chef; then he’s in charge and I’m the support. That is the dance. That is the magic. And that is how all of us create our own individual memories and stories. What favorite food takes you back to a particular memory? BAH Note: I made a few modifications to the recipe that Debra was kind enough to supply. Since this is Debra’s memory, I’m showing the recipe she used. But lean in and I’ll tell you what I did different. First, I used all of pulp I got from a 3 pound squash. I didn’t measure out exactly how many cups this was but I was happy with the results. Next, you’ll want to remember to roast your squash cut side down. I didn’t and had to double the oven time for my butternut. Also, I changed up the amount of liquids. I used a 12 ounce can of pear nectar, one can of vegetable broth, and 2 cups water. Lastly, I didn’t have another pear to use for garnish so I improvised by crisping up some prosciutto and sprinkled it on the top like confetti. Cut squash in half lengthwise; discard seeds and membrane. Place squash halves, cut sides down, on a baking sheet; bake at 375° for 45 minutes or until tender. Cool. Peel squash; mash pulp. Set aside 3 1/2 cups pulp, reserving remaining squash for another use. Melt butter in a large Dutch oven over medium-high heat. Add chopped pear and onion; sauté 10 minutes or until lightly browned. Add squash pulp, water, and next 5 ingredients (water through pepper). Bring to a boil; partially cover, reduce heat, and simmer 40 minutes. Place one-third of squash mixture in a blender; process until smooth. Pour puréed mixture into a large bowl; repeat procedure with remaining squash mixture. Return squash mixture to pan; stir in half-and-half. Cook over low heat 3 minutes or until thoroughly heated. Ladle soup into bowls, and garnish with pear slices. What a great husband you have, Debra! This soup does sound a little odd at first but I can see how the flavors would work together. Very comforting! Kitch, I wonder if Deborah and The Professor would open a kitchen bootcamp for husbands who do not cook? I’d pay good money to send mine. Oh Wendy, good friend of mine – you did not badger me and have always, always been to kind; I’m so flattered you think my recipes and stories are worthy of Food Memories and I am happy to share. It really is one of the many reasons I blog – it’s the food that connects us all (which is the tagline for Smith Bites). Reading my post here, brings back all those memories, some bittersweet yes, because my dad passed away shortly after that visit. But happy memories as well because when The Professor makes this soup every fall, I remember my dad and I’m also reminded of how lucky I am to have a husband who cooks for me. Thanks for sharing! Deborah, I would post one of your Food Memories in a heartbeat. I couldn’t agree more that food connects us in powerful ways that is worth honoring and celebrating. And I love sharing these stories with others. Thank you for helping me do that with both of these stories. It’s fun to seek out new recipes but there are always those days when all you want is a familiar favorite. Even better when your husband is the one making it for you. The addition of pear to this bisque sounds awesome. Ali, I would be overjoyed if I could get The Mistah to make soup. Deborah is one lucky woman that The Professor is at home in the kitchen. j’adore the addition of pears or apples in a soup, the sweetness it adds makes the dish more rustic and well.. sweet. i think any meal with rice reminds me of my childhood, it’s what i grew up with, it’s what i crave the most when i am seeking comfort. Lan, I wish I had some of this soup today as wet and nasty as the weather is. I think I’m going to make it for a brunch I have coming up next month. this looks absolutely incredible, wow! Beth, perhaps you and I should start a soup club so that you get your butternut on. So sad that Noel doesn’t share the love. But like I said to Biz, it freezes beautifully. I am with Beth – I can’t tell you how many butternut squash and apple bisques, acorn squash soups that are out of this world delicious, and my husband? Won’t.Even.Try.Them. Oh well, that leaves more for me! The last time I made butternut squash soup I sprinkled just a bit of crumbled goat cheese over the top – it was delicious! Biz, all I can say is that leaves more soup for you. These soups freeze pretty well so even if you didn’t want to eat a whole batch, you could freeze single servings off for later enjoyment. This is such a gorgeous soup! I love the pear in there! Tracy, the pear does bring a little something different to the party. Oh wow, I’m going to have to try this sometime! I already make a similar soup with butternut & acorn squash together and it is sweetened with a little apple cider and molasses – pears and pear nectar sound even better. Here’s a funny food memory – when I was a kid, my family always vacationed in Biddeford, Maine on the beach. My sister and I were thrilled when our best friend Renae got to come with us. There was a little store with take-out food across from the beach and when we were older, we got to walk over there by ourselves. Well, one year imagine our glee when a new item was placed on the menu – french fries covered in melted cheese! Not only was that a great thing in and of itself, but the name of this dish just made our week – Snotties!!!!! Yep, disgusting name, but we were probably 11, 12 and 13 at the time and it could not have been more hilarious. Okay, my mom thought it was hysterical too. These days all we have to do to make each other laugh is look at each other and yell, Snotties!!!! And all the fun memories of those vacations in Maine come rushing back. Jennifer, this soup was absolutely delightful. And I say that as someone who doesn’t really care for pears. I cannot believe anyone would desecrate cheese fries by calling them Snooties. It’s just plain wrong. That soup looks beautiful! I always enjoy new ways to jazz up butternut soup since I find the plain version kind of boring. This looks perfect! Jen, this is a great fall soup to cozy up with. Could be a perfect after Thanksgiving meal. When Debra writes “he’s all about the tried and true familiar recipes while I’m all about […] discovering unique and exciting ones,” I thought “that’s me and my husband too!” It really is. He goes back to a familiar few (spaghetti, “mush,” honey ginger chicken, and blue cheese steak) and I’m constantly finding new things to make. I usually won’t make a recipe twice unless I absolutely adore it, because my list of exciting things to try is always so long! Jenna, I also find it hard to go back to old favorites just because there are so many recipes I still want to try. I am not at all aided by The Mistah who has never made a single dinner request. Bless his heart, he’s happy to eat whatever I make…it’s a blessing and a curse. I like the idea of using pear nectar in a soup. Thanks for sharing! I had to think for a minute, but chicken francaise – or the thought of it since I haven’t eaten this dish in years – takes me back to The Olive Tree Restaurant. I was in high school then, and the chicken was bright and lemony, and eating it was the first time I realized how fun and interesting food could be. Jen, I had to poke around the grocery store but I found a small can of pear nectar. It brings a sweetness to the soup. Anna, I don’t know if you can still get your hands on any butternut squash but this is some good soup.